Wylaco carries an extensive line of top quality fall protection gear and equipment from companies MSA. If you cannot find what you are looking for please call us at (800)-876-2325 and one of our experts will assist you. Features: A durable, engineered thermoplastic housing to increase service life Rugged, impact-absorbing protective bumpers for added durability A constant lock-up rate to prevent the erratic,jerky, lock-up (like a seat belt) found on some types of retractables Specifications: Load Cap. : 400 lb [Max] Connection Type: Back D-Connector Hook Type: LC Snaphook .. The MSA 10093351 11' Workman Web Personal Fall Limiter with an AL64 Locking Rebar Snap Hook features a solid design and fast-acting brake mechanism, you can be confident that the Workman Personal Fall Limiter (PFL) will be there for you when you need it most. The durable, engineered thermoplastic housing decreases weight while the rugged, impact-absorbing protective bumpers add durability. A.. Features: 30' line length 1'' Steel Carabiner Field Line Replacement (In the event that the webbing should become damaged, this option provides a field replaceable web lifeline , eliminating costly returns to the manufacturer) Lightweight design starting at 7.5 pounds Durable, engineered thermoplastic housing to increase service life Rugged, impact-absorbing protective bumpers for added du.. Features: Harness Snap is LS and Anchorage Conectors are GL3100 Snaps 6' Shock-Absorbing lanyard Harness Connector is LS Snap Anchorage Connections are (2) GL3100 Snap type Twin Leg -with Expanyard Expanyard contracts to 4.5' to reduce trip/snag hazards Pouchless design Ships one per box Meets OSHA regulations, ANSI Z359.1-1992 (R1999), ANSI A10.32 Is CSA Certified .. Description: Sure-Climb Slider (fall arrester) with carabine .. Description: MSA Dyna-Lock 3/16 Inches Galvanized Steel Rope Self-Retracting Lanyard. Dyna-Lock SRL's have three continuously moving independent braking mechanisms to prevent freezing in icy or corro-sive conditions. A built-in shock absorber limits fall arrest forces to under 900 lbs. Has a 4 1/2' per second locking speed. Available with 3/16" galvanized or sta.. 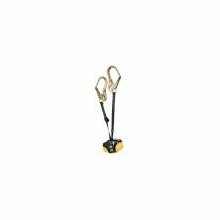 Features: Harness and Anchorage Conectors are LS Snaps 6' Shock-Absorbing lanyard Harness & Anchorage Connections are LS Snap type Single Leg -with Expanyard Expanyard contracts to 4.5' to reduce trip/snag hazards Pouchless design Ships one per box Meets OSHA regulations, ANSI Z359.1-1992 (R1999), ANSI A10.32 Is CSA Certified .. Description: FP Pro Harness vest style. Tongue buckle leg strap,(std size)Provides comfortable protection due to its lightweight design. Available in cross-chest and vest styles with optional D-Rings for work positioning. Fits a wide range of body types and sizes. Color-contrasting thigh and torso straps simplify donning and bright red polyester webbing offers high visibility. 2 hip and 1 back D-.. Description: Lightweight at only 4 1/2 lbs with a 400 lb. load capacity and easy, single hand installation. This strong, secure anchorage connector glides effortlessly along the beam flange with it's low friction wear pads with Teflon, which eliminates metal-to-metal contact. The intregal load indicator alerts user if the unit has been exposed to a fall. Versatile design allows for mountin.. Description: Anchors install easily and can be quickly removed for additional projects. .. Features: Abrasion-resistant, strong, durable webbing Web retainer collars to keep excess webbing neat Integral backpad for added comfort during work positioning and a removable, tongue-buckle tool belt Shoulder pads Size Group 2X-Large Connection Type D-Ring Back, D-Ring Hips Fastening Method Tongue Buckle Legs, Qwik-FitT Chest Strap Color .. Features: Abrasion-resistant, strong, durable webbing Web retainer collars to keep excess webbing neat Integral backpad for added comfort during work positioning and a removable, tongue-buckle tool belt Shoulder pads Size Group X-Large Connection Type D-Ring Back, D-Ring Hips Fastening Method Tongue Buckle Legs, Qwik-FitT Chest Strap Col.. Description: Lanyards feature a solid design and fast-acting brake mechanism with rugged, impact-absorbing protective bumpers for added durability. 400 lb working capacity. Meets ANSI A10.32, all applicable OSHA Standards and are CSA certified. Features: UOM: EA Line Length: 12' Properties: With its solid design and fast-acting brake mechanism, you can be confid..
Dual-locking cams offer redundancy of connection €“ only a single cam is required to maintain connection Locking cams move in opposite directions to prevent accidental disengagement Locking cam guards help to prevent unintentional contact with cam High strength cam design €“ only one cam is needed to maintain secure attachment Load Cap. : 40..
Fall Protection Kit For RoofersTitan Compliance Fall Protection KitMeets Osha, Ansi, A10.32 & Csa RequirementsIncludes: Lightweight, Comfortable Harness -W/back D-ring, Mating Buckle Chest & Leg -Straps For 3 Points Of Adjustment, Back And -Sub-pelvic Straps, Rope Grab W/3 Foot Shock-Absorbing Lanyard Plus A Uv & Moisture Resistant-Vertical Lifeline W/snap Hook & Roof AnchorSize:50 Ft. Lifeline..
Fall Protection Kit For RoofersTitan Compliance Fall Protection KitMeets Osha, Ansi, A10.32 & Csa RequirementsIncludes: Lightweight, Comfortable Harness -W/back D-ring, Mating Buckle Chest & Leg -Straps For 3 Points Of Adjustment, Back And -Sub-pelvic Straps, Rope Grab W/3 Foot Shock-Absorbing Lanyard Plus A Uv & Moisture Resistant-Vertical Lifeline W/snap Hook & Roof AnchorSize:25 Ft. Lifeline..
General Duty Fall Protection Bag: Stores fall protection equipment. Reflective tape stripe.600D polyesterDrawstring opening and barrel lock closureWebbing carry strap handle, grommeted drain holeFlap to protect from dust-filled environmentsReflective stripe10in L x 10in W x 15in H (26cm x 26cm x 38cm)1500 ci. (25 I)..